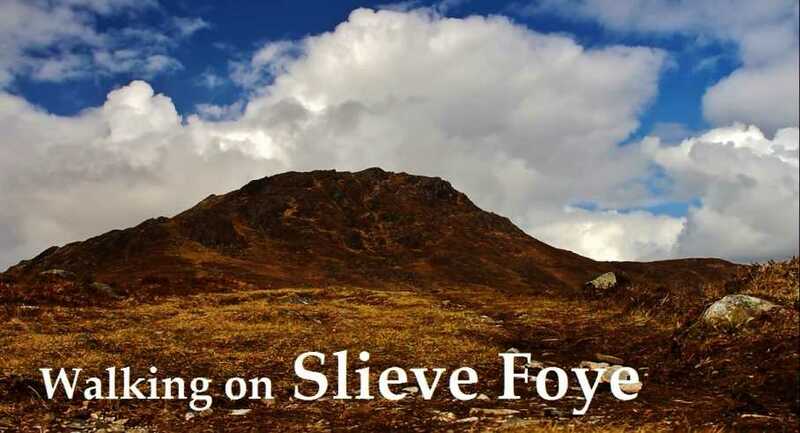 Slieve Foye is just great in so many ways and a recent visit rekindled memories from previous walks and created great new ones. Carlingford is a great base to explore Slieve Foye and the waymarked ways out of the village provide clear direction on to the hillside. A steady climb tantalizes the views that get ever better with time and height. Grazing horses have seen it all before and are more content to bury their heads in the grass. The gentle ridge is reached and steady climbing, following markers, brings the much more exciting rocky outcrops to explore. Pools of water had clumps of frogspawn and clouds built from the clear skies to bring hail showers that produced rainbows over Carlingford Lough. The trig pillar stands aloft with its views south towards Dublin and the Wickow Mtns. there is no doubt though that the views to the north over Carlingford Lough to the Mourne Mtns are one of the most dramatic features of this mountain. Fishing boats circled at their work, ferries plied trade from across the Irish Sea and patches of light made their way to the mouth of the Lough. The High Mournes rose pointedly in the distance. What follows is a wonderful walk along a rocky ridge, with amazing views all the way. Passing showers brought rich colours to the sky, the sea and the mountains. Dropping down steeply to the north, following a stream, brought the forest and gentle tracks heading back to Carlingford. Travelling further across Ravens and Foxes rock to more of the Cooley Mtns is also a great option. There is a great looking paintballing complex in the forest and as i entered Carlingford what seemed like hundreds of young people were heading uphill with their guns for some adventure.